For everyone who loves dancing, games and unlimited fun, we have compiled a top-list of the 23 best dance applications for the smartphone. Dancing with the Stars is a popular television show in America, on the basis of which an independent project with the same name was created. At the very beginning, the game proposes to design a character for dancing and go to impress the jury and stand on top of the glory. The project has excellent graphics and good animation of all dancers. Dancing with the Stars can be a good learning tutorial. Among the advantages of the game, you can also note a large selection of clothes and makeup, an abundance of the most popular songs and a large number of command modes. Hip Hop Dance School Game is a great game for all people who are fond of dancing. The gameplay is based on a rather interesting story. So, you were just noticed by one of the best agents, specializing in the promotion of hip-hop stars. The main goal of the player is to improve his movements and skills, and as a consequence, each new achievement will help you to find more fans. Prove that you are one of the best dancers in this genre. Dress in beautiful dance clothes, create your own dance and become the first in the world rating of dance stars. The game will appeal to those people who can not imagine their life without Hip Hop dances. As in real life, you will need to defend your reputation. Amaze all jury members, and you will be able to get the highest appreciation of your skills. Facejjang is an application that allows you to upload your photo or photos of friends to funny, dance videos. You only need to select a template to use (many are available for free) and run a creative process. First, you need to properly select the face to be used. To do this, you need to outline the contours of the face indicating the line of the eyes and the position of the lips. After that, you can add various accessories such as hats, wigs, glasses, ties, and so on. After adding faces to the video template, you will have to wait a few seconds for the file to be processed. After that, the application automatically saves the video to the device, and you can view it or publish it anywhere. Facejjang is a fun application that gives pretty good results. In less than a minute or two, you can create a wonderful, personalized video to share it with your friends. 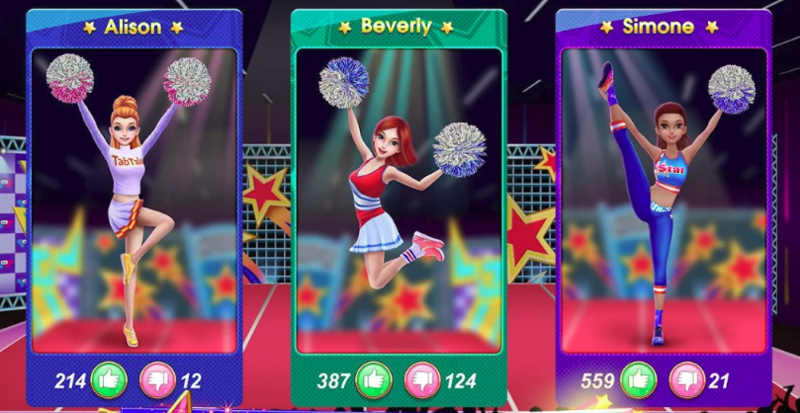 Cheerleader Dance Off – Squad of Champions is a colorful application in which everyone can join the ranks of the cheerleading squad. The application will please with an interesting story. Gamers have to interact with a girl who has just moved from another school. And she hopes to be the best in the cheerleading squad. The new one knows how to dance well, what will only help achieve the goals set, or even more. Help the team to win in the main competition of the year, and you will definitely get a decent reward. Learn new movements, show them to your friends, and you will be able to become the most popular in school. Zumba, as a separate direction, appeared relatively recently and quickly won crowds of fans around the world. And no wonder: this is a real holiday! Zumba combined elements of fitness and aerobics, and the incendiary steps of many dances: salsa, bachata, samba, flamenco, cha cha cha and much more. It is impossible to remain indifferent, having come to this lesson: this dance is too incendiary and energetic for this. It just infects the dancers with positive and good mood. This is not just a mediocre fitness exercise. This is, first of all, a lot of fun! Anyone can learn it. The main thing is not to be lazy and go to classes responsibly. All movements are simple and understandable. The main thing is to learn them and start dancing. Zum.ba Dance Workout has tips and videos about Zumba. Training videos are played when you have a stable Internet connection. Hip-hop is one of the most popular trends in modern youth dance cultures. Today, the direction of hip-hop is about 40 years. And, if at the beginning of the birth of the dance the movements were quite simple, now hip-hop is a rather complicated and energy-intensive process, with serious dance techniques. Hip Hop Dance Steps Videos has a huge collection of video tutorials. They are all free and of high quality. If you start training with this app, you can add videos to Favorite list or bookmark them for easy access. It is also possible to share videos with friends via social networks. Many girls know that belly dancing is very useful for health and is also an excellent way to achieve an ideal figure. Hot Latest Belly Dance 2018 application for Android has New latest Belly dance videos to start training right now. You can learn this kind of dance absolutely at any age, even if you are over forty. Thanks to the belly dancing, any woman will feel divine and beautiful. Perhaps for someone belly dance may seem simple, but in fact, it has a considerable load on the body, especially the muscles of the body. If you try to do belly dancing for about a month, then you will noticeably see the difference. And also it is worth noting that belly dancing gives positive emotions and good mood. Many girls dream to dance beautifully, but not everyone has time and money for classes. However, for the development of flexibility and plastics, it is not necessary to take specialized classes. You can learn the basics of dance art at home. So, if you decide to learn to dance, do not delay. Just download the Dance Steps Videos and repeat after the instructors the main movements of modern, street, ballroom and social dances. In fact, this isn’t more difficult than any other business in which you’re a beginner. Dance directions differ from each other. Even if you have mastered one of them, it will be unusual for you to study another. However, all dances are associated with the ability to own one’s body. And if you aren’t new in it (for example, you were engaged in martial arts, gymnastics, swimming and even dancing), it will be easier for you to adapt to new movements than for a novice. Learning to dance at home is a great addition to studying at the Salsa school. Make home dance training your habit! Do you have a free half an hour? Perfectly! Stand in front of a mirror and dance with Pocket Salsa! A great advantage of home practice is that a pair isn’t required. You can study pair figures in the ballroom, and at home you can work on plastic, learning footwork, practicing turning techniques, studying rumba or reggaeton. All this can be learned independently, without a partner. If several times weekly, in addition to classes at school, you will dance at home with this application – believe, the results will be just fantastic! Here are video lessons that are easy to perform at home. All you need is a couple of square meters of free space and a little time. You will find more than 100 dance video lessons by the famous instructors of Addicted2Salsa. Kizomba is one of the easiest dances, its distinctive feature is the absence of difficult figures, high-speed dance moves. You can try to own your body at home. You need to start by studying the basic steps of Kizomba. There are not too many basic movements, and you will be able to learn them with your partner, in a usual situation with this application. How to dance Kizomba application will help you to start kizomba dancing, even if you do not have the opportunity to attend a school. Of course, like all dances, you need to start dancing kizomba with basic steps. You can learn to dance them with video lessons which are presented in the application. The app includes videos of initiation, intermediate level, advanced levels. 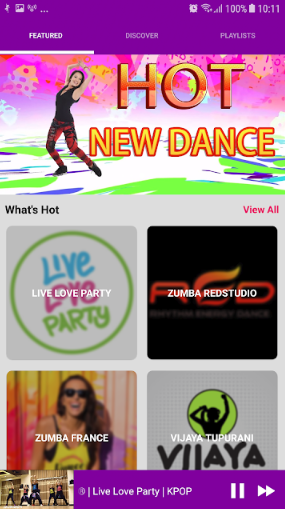 Super Dancer is a social online dance game made using Unity 3D technologies. The game is characterized by high-quality graphics with bright characters, a social component and of course incendiary dances. Play, dance, chat, have fun and get a lot of positive emotions from this incendiary game. Thousands of fashionable and stylish costumes can appear in your closet. If you are tired of dancing yourself, it’s time to go hand in hand with your friend in paired dance. Dance management is simple and laid-back. Breakdance is one of the styles of street dancing. It is one of the oldest and most popular styles. The basis for the dance was the hip-hop movement. Break-dance is considered to be the most extreme of modern dance directions, the elements of breakdance require the dancer to have great physical strength and endurance. 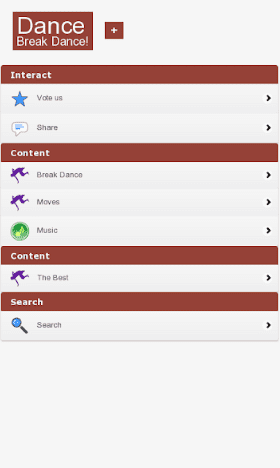 If you decide that you want to learn how to dance break dance, we recommend testing this application. It will help to make the first steps in mastering this kind of dance. This power, athletic and extreme direction allows one to develop the flexibility and coordination of the body as best as possible, to learn how to use physical forces in combination with creative abilities, to fully express yourself in dance. Ballroom dancing is not just dancing, it’s a whole art, and at the same time science, sport, passion, in a word – a whole life embodied in the movement. Also, ballroom dances aren’t in vain called sports – it is a colossal training for all the muscles of the body, as well as a correct and healthy cardiac load. That’s why many of us want to master this direction. How to do it? 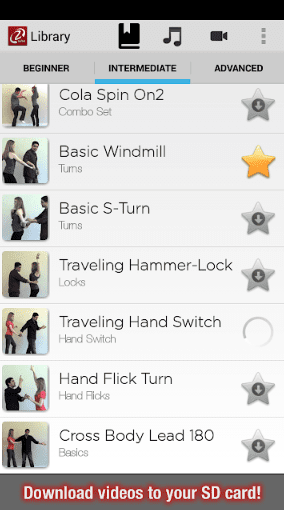 To learn basic movements of the main popular directions of ballroom dancing, it is enough to download the Ballroom Dancing application. Here, you will learn the moves with videos and dance lessons. These lessons are suitable for beginners as well as for well-prepared dancers for improving the mastery. All the dances are shown in detail, so you will not have much difficulty learning them at home. It’s never too late to start ballroom dancing, you can learn to dance magnificently at any age. You only need a desire to master this style of dance. What only a woman can not do to stay as beautiful, young and desirable as possible for as long as possible. But the recipe for feminine beauty and well-being was created many centuries ago. It’s belly dancing. The Belly Dance application is nice to perform this sport at home and anywhere. For most people, belly dancing is simply an exciting desire for oriental dance. However, it is extremely useful for the healing and strengthening of the female body. During the dance, all muscle groups are loaded, including those that aren’t involved in everyday life. Dance for your own pleasure: beautiful music contributes to this. ElfYourself by Office Depot is a simple entertainment application thanks to which you can have fun laughing. You need to upload a photo of your face or your friends to become a real Christmas elf and make a hilarious dance. The choice of a musical theme will start the video generator and soon it will be possible to watch, send by email, post to Facebook or save to your phone. Do you want to create something funny and make your friends laugh? Then this application definitely suits you. Do you like to dance, or maybe just dream about it? All dreams are real, remember! Dance On Mobile will help you dance anywhere, and not alone, but with the whole clan that you will create yourself. For this, you will only need a telephone. The game has a very bright and clear graphics. Cool graphics and easy control will capture you. A fairy tale of love and dancing awaits you. Dances are divided into two options: team battle or one on one battle. You are expected to complete various quests, so you will have to dance a lot! Any battle is accompanied with music, tune it to your liking. It is also possible to receive extra points, by taking care of your garden. Grow and water flowers, trees, berries in your garden and get even more coins. Earned coins will help you increase your points in the standings. 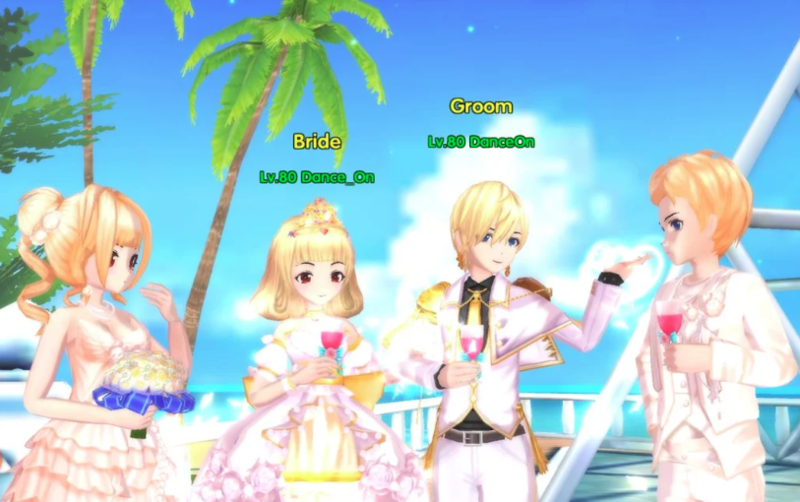 Learn fashionable dances and recruit as many people as possible on your team. Make it easy and simple, share your nickname with friends or acquaintances and call them to your clan. Go to the store and choose a brilliant outfit, make a beautiful hairstyle and change your makeup. The world of fashion is very diverse and great. The most important thing is that after passing and winning the quests, there will be valuable prizes. This game will appeal to all lovers of incendiary and refined dances, who cannot live a day without this wonderful and useful business. What is better fashionable and audacious hip-hop or classical and graceful ballet? Especially for this purpose Beauty Inc developed the application Dance War – Ballet vs Hip-hop. Here, you need to choose a side immediately, as further participation in the dance mega competition follows. Then choose the character you like, along with her makeup, outfit, and hairstyle. Make your heroine the most charming among all the participants. As in any competition in this game, there will be a lot of tests, sometimes very difficult. But you don’t need to be upset, you will cope with the tasks set and will be able to prove to everyone that you have no equal in the chosen dance style. This application will become equally interesting for a young lady, and older girls. Everything is very bright, colorful and unforgettable fun. Installing it, you get not only mischievous fun but a colossal amount of positive emotions and a charge of vivacity. Study a variety of movements, reach a high level in your favorite business. Choose your role, perform tasks. All this will certainly lead you to the finish. Care for your heroine, when she is tired, go to the spa, with sprains and injuries – to the doctor, and to always be in the proper form – in the gym. Do everything to impress judges with dances! 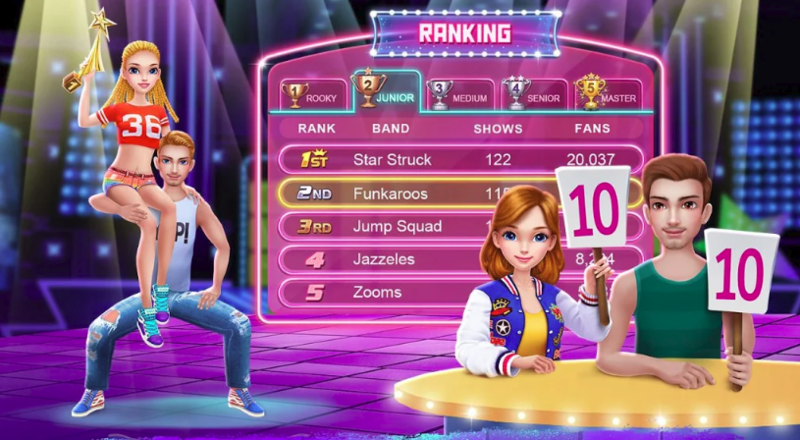 Dance School Stories is an excellent simulator for Android, where the user has to actively train to win and take place in other competitions. A free game will make you feel like a ballerina, waiting for real trials to achieve glory and recognition. The main idea of the application is active training and competitions, allowing the main character to gain fame. The institution has good choreography teachers who guide you all the way to success. By pressing the right button in time, the gamer will control the movements of the character. If all goes well, then points and rewards are awarded. The android game will please with good, intuitive control, due to which even users with little experience will be able to try their hand, achieving good results. Dance School Stories quite a dynamic game, as the further the gamer moves, the harder the tasks become. Master the skills with constant rehearsals, trying to perfectly perform the commands of the choreographer. Pleasant graphics makes the gameplay quite bright, exciting and interesting. The musical accompaniment varies depending on the circumstances. 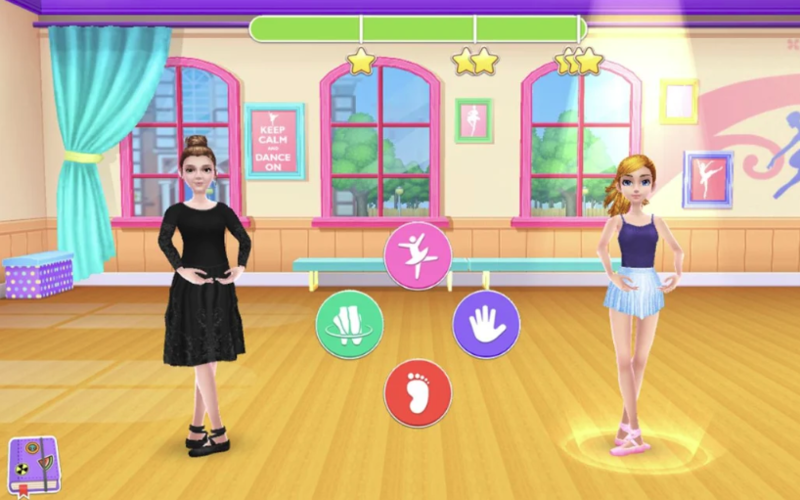 Dance School Stories – an excellent entertainment application for Android, which will allow you to spend time enjoying your favorite business and performing a variety of movements. The green alien dance is an extraordinarily entertaining application developed by the Istanbul studio “Green Alien” for mobile devices based on the Android operating system. The application is not a game or an instrument, in fact, it is a video with a dancing green alien creature dancing to music. What is the purpose of this creation remains a mystery, but most users evaluate it positively and classify as a training video. Running the application The green alien dance the user will see a window of the media player with the start and rewind button. Clicking on the start, we’ll see a nearly two-minute video clip with a dancing alien. This completes the functional capabilities of the product. If you like the proposed dance, then you can easily learn it by putting the recording on pause in the right place. On the creator’s page, there is a similar application in which video recordings of people imitating the movement of a green man for the same music are collected. 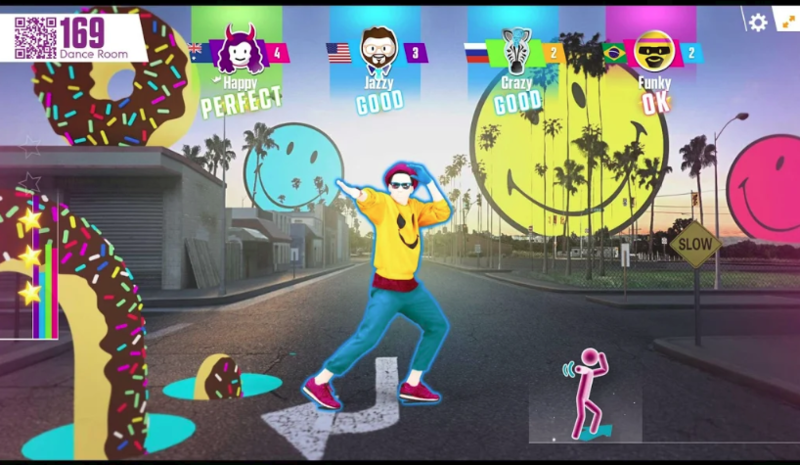 Just Dance Now – dance everywhere with this wonderful game. Plunge into the wonderful world of dancing without the use of a game console, you only need a smartphone and a device with a screen. The rules of this dancing game are elementary. Players only need to select a musical hit, gather a noisy company and start performing complex dance elements, comic performances, and solo performances. If there isn’t enough space on the dance floor, then start recording dance with the function DanceCam – share the videos on the social network, saving the best moments for joint views! There are hundreds of melodies to choose from for your dance. Run the game and start dancing incredibly simply and quickly: you need only a couple of clicks. Be entertained and communicate with hundreds of other players, and also perform joint dances with them. Customize the music playlist on your own and get coins to expand it. On the health control panel, you can see the number of calories burned. In the free trial version, you will get access to the full catalog for a week. The game requires a connection to the Internet. Download Just Dance Now for Android right now – it’s a great way to cheer up and get a dose of fine mood! Do you miss on the way to your favorite dance school? – Fun and bright game Coco Party will be a great entertainment on the road for you! Coco Party – a new casual game in the long series of adventures of the fashionista and beautiful Coco. This time you will go to the dance floor. Do makeup and start! Coco decided to become the true queen of the dance floor at all costs, but she couldn’t cope without your help. Show your impeccable sense of style! Pick up a cool suit for her from a huge game wardrobe and decorate it with gorgeous accessories. Send Coco to the beauty salon. Change the color of her skin, eyes, and lips, dye her hair to your liking and make a stunning hairdo. Do a professional stage make-up, which will emphasize her personality and make unique among other girls. It seems everything is ready? Don’t forget to make a photo of such a beauty for memory. Think of the most incendiary dance for a party, combine movements. Each entrance to the stage is made in the form of an exciting mini-game, where players have to press buttons in time for the best results. Hit the targets at the right time, perform incendiary dancing moves and get the highest rating! Spark off the dance floor and hit the heart of a strict jury. And don’t doubt: this evening, everyone will be at your feet.